Ronnie O’Sullivan edged a 4-3 victory against hugely talented Chinese teenager Zhao Xintong on Wednesday night to reach the last 32 of the Coral English Open. Tipped as a potential world beater, 19-year-old Zhao showed his scoring power with two centuries and the tour rookie had chances to win from 3-2 up. But eventually it was crowd favourite O’Sullivan who came through to set up a third round match with Chris Wakelin on Thursday at 12pm (tickets still available, click here for details). O’Sullivan narrowly missed out on a 29th career ranking title at last week’s European Masters in Romania, losing 9-8 to Judd Trump in the final, and looks to be building momentum again this week in Manchester. Zhao made a blistering start with a 130 total clearance in the first frame. O’Sullivan levelled by clearing from yellow to pink then a run of 85 put him 2-1 up. Zhao responded with a 107 to win the fourth frame and came from 50-0 down in the fifth to take it with a superb 80 clearance. 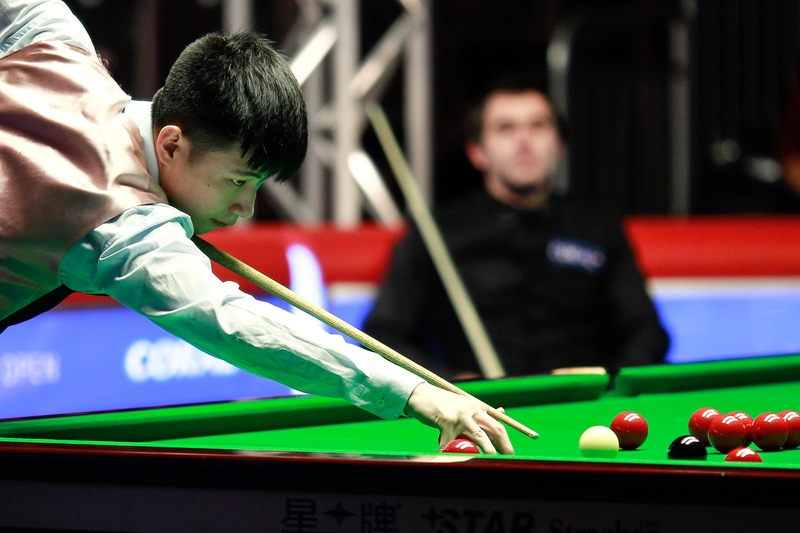 In frame six, Zhao had a match-winning opportunity but could only make 28 before running out of position. O’Sullivan later cleared from the last red to make it 3-3. A break of 62 put O’Sullivan in charge of the decider, and Zhao’s attempted counter-attack ended when he missed a red to a top corner on 18, allowing his opponent to wrap up the result. Judd Trump was also pushed all the way before securing a 4-3 win over amateur Jamie Bodle. The match was forced onto an outside table because of the late-running schedule on the televised table, and that suited Bodle as he built leads of 2-0 and 3-2 with a top break of 68. Trump hit back with a 134 in frame six, then came from 28-0 down to win the decider with runs of 20 and 46. World Champion Mark Selby was the biggest casualty on day three, losing 4-3 to world number 106 Liam Highfield. After Highfield took an edgy first frame, Selby responded strongly and looked to have found his form in the second. A run of 89 helped to restore parity at 1-1. However, it was the 25-year-old Highfield who moved 3-2 in front. Selby forced a decider with 99 in the sixth, but Highfield won a tense seventh frame 73-5 to claim the biggest win of his career. 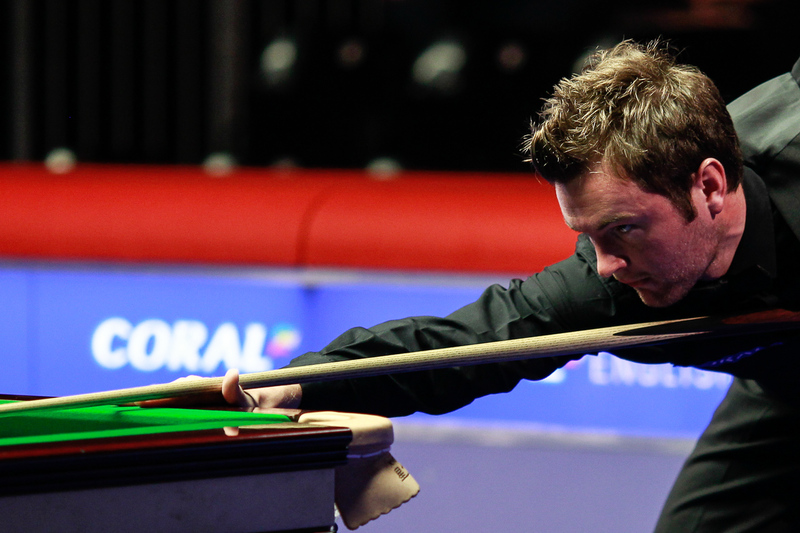 World number four Shaun Murphy also suffered a 4-3 defeat, against Liang Wenbo. China’s Liang led 3-1 after a top run of 136 before Murphy hit back to 3-3 with 87 and 50. Both players had chances in the decider and the key moment came when Murphy missed a long pot on the third last red when he led 40-14, letting his opponent in to make a winning clearance. John Higgins beat Mark King 4-1 with a top break of 103 while Neil Robertson saw off Duane Jones by the same scoreline with a top run of 102.